Content Station contains many features and options but not all of them are used on a daily basis. Use this article to learn more about the main features and about how to get started when you are new to Content Station. See also Content Station 9 feature comparison. Step 2. (Optional) From the Sever list, choose the server that you want to log in to. Step 4. (Optional) The default setting is to log in to Content Station Pro Edition. 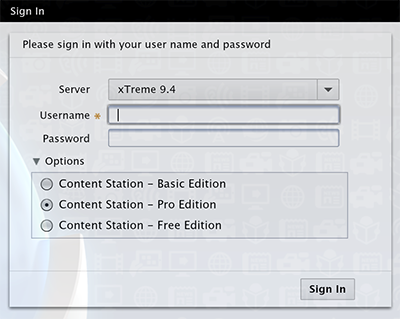 To log in to the Content Station Basic Edition or the Content Station Free Edition, click Options and choose the version that you want to log in to. The Home screen of Content Station is opened. Note: Once you have accessed Content Station, any opened windows are saved when logging out and automatically opened when you log in. You may then not necessarily see the Home screen appear. 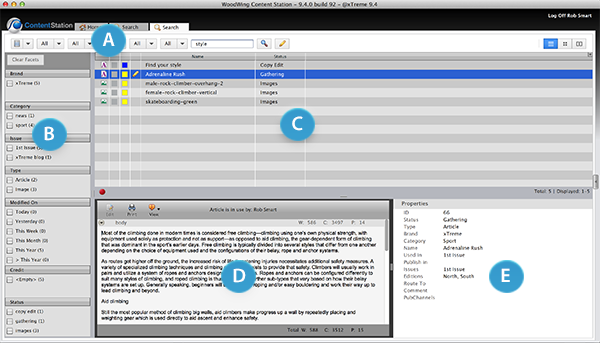 Working in Content Station involves opening files (such as articles or Dossiers) and using Applications: features that allow you to perform a specific task such as searching for files, uploading files, publishing files and more. The Inbox showing all files that have been routed to you. The Recent Items pane showing the last 20 items that you have worked on. 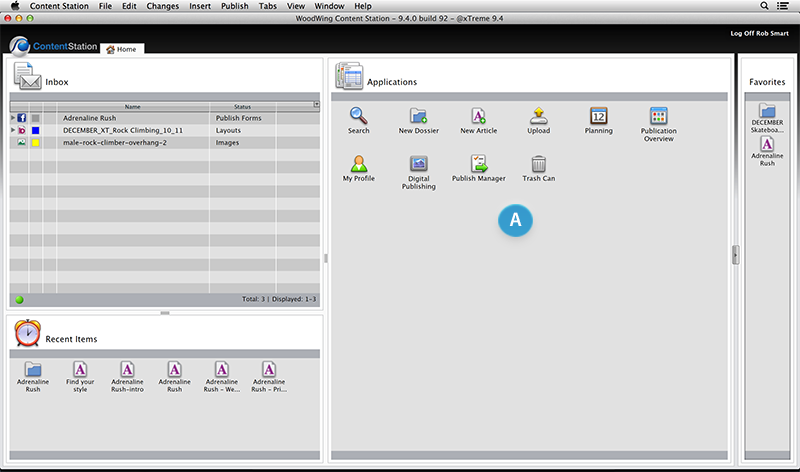 The Applications pane showing all Applications that you can use. 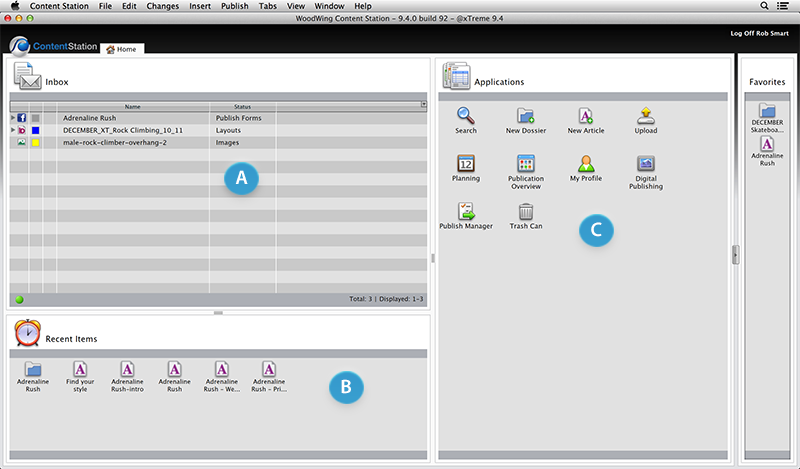 Figure: The different areas of the Home Screen: the Inbox (A), the Recent Items pane (B) and the Applications pane (C). You continue from here by double-clicking a file or by double-clicking an Application. 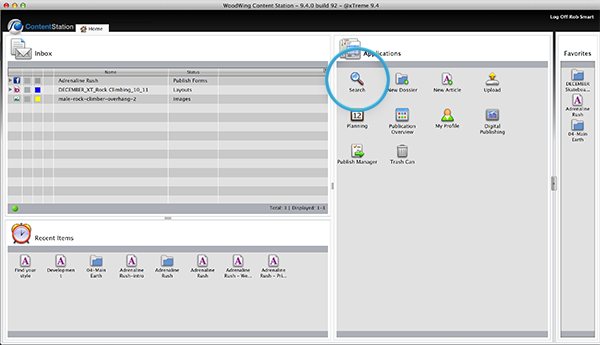 Note: For an overview of the available Applications, see Working with Applications in Content Station 9. When you double-click a Dossier, an article outside of a Dossier, or an Application, a new page is opened. Each page has its own tab and when multiple pages are open you can click a tab to return to that particular page. Tabs can be re-ordered by dragging them into a new position. 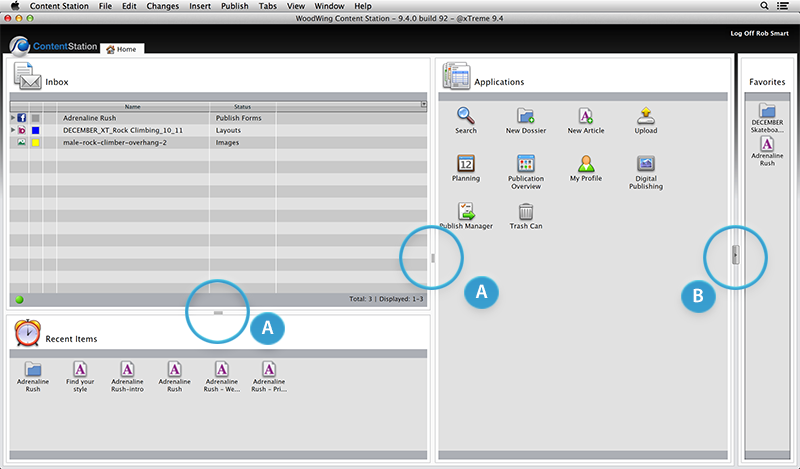 A Dossier, article or Application can be opened in its own window, for example to view it on a different monitor. To do this, right-click the Dossier, article or Application and choose 'Open in New Window'. 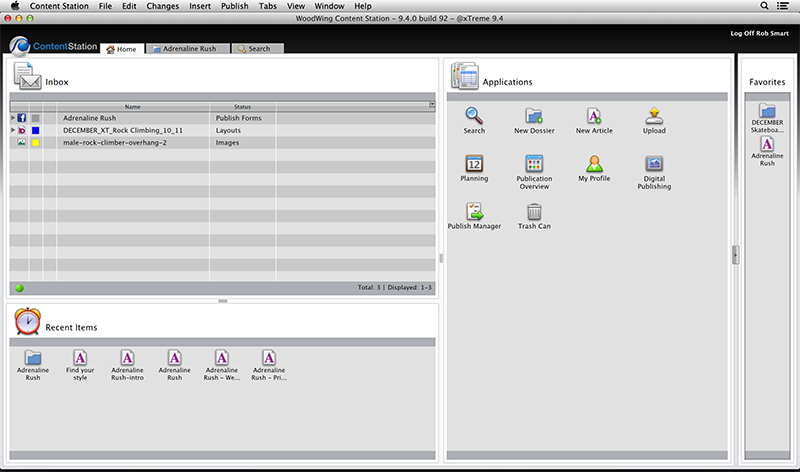 When logging out of Content Station, any opened tabs and windows are stored. When next logging in to Content Station these tabs and windows are restored again. Each page is divided into one or more panes: areas holding specific information or content. Search pane. Used for specifying criteria to locate files that are stored in Enterprise. The results are subsequently displayed in the Document pane. Facetted search pane. Used for narrowing down the search results. Document pane. 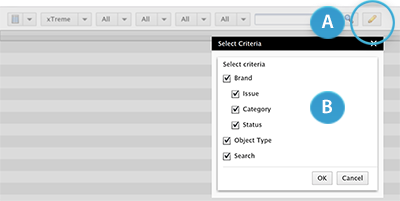 Displays all files found, based on the criteria specified in the Search pane. Preview pane. When selecting a file in the Document pane, the Preview pane will show a preview of that file. 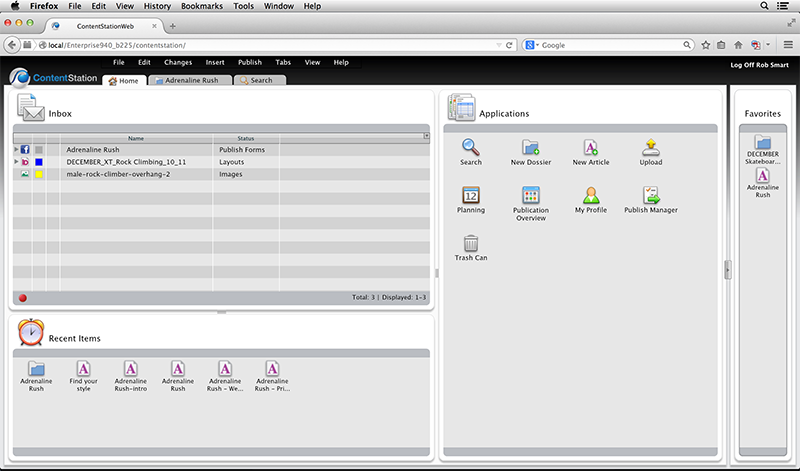 Properties pane. When selecting a file in the Document pane, the Properties pane will show the properties of that file (such as the Brand it belongs to, the Status it has been assigned, and so on). Figure: The different panes of the Search Application: the Search pane (A), the Facetted Search pane (B), the Document pane (C), the Preview pane (D) and the Properties pane (E). Exactly which panes appear depends on the type of page that is opened. The Document pane appears in various locations and shows you the files that you have access to. These could be the files that are part of a Dossier or all files that are found after performing a search. List view mode. The files are shown as a list with columns and rows. This is the default view and suitable for day-to-day work. Thumbnail view mode. Small previews of the files are shown. Use this when working with images or layouts. Detail view mode. Similar to List view mode but now the first few sentences of an article are shown. You can change the modes by clicking the buttons to the top right of the Document pane. 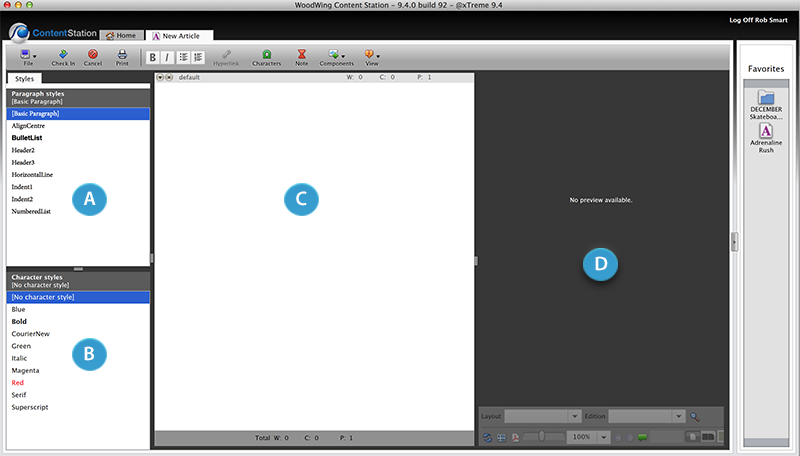 Figure: The buttons for changing the view mode of the Document pane (A). When using the Document pane in List View mode, you can choose which columns you want to see and which you don't want to see. Step 1. Click the Column List button located just above the column headers to the far right. Step 2. From the menu select the columns you want to view and de-select the columns that you want to hide. Step 3. (Optional) When working in a Dossier, select Use as Default from the menu to make the current settings default for all Dossiers. You can increase or decrease the size of a pane by dragging one of the handles. Some panes can also be hidden completely. Figure: Handles allow you to resize the various panes (A) or to hide/show a pane (B). Before you start using Content Station you might want to set some preferences, for instance setting the size of fonts in specific parts of the program or setting the language for the spell checker. How to use these Applications is explained in the following topics of this article. The files that you will be working on are all stored in a database. You can browse or search the database by using the Search Application. To find out more about searching for files (including storing custom searches), see Searching for files using Content Station 9. To quickly preview a file anywhere in Content Station, select the file and press the spacebar. 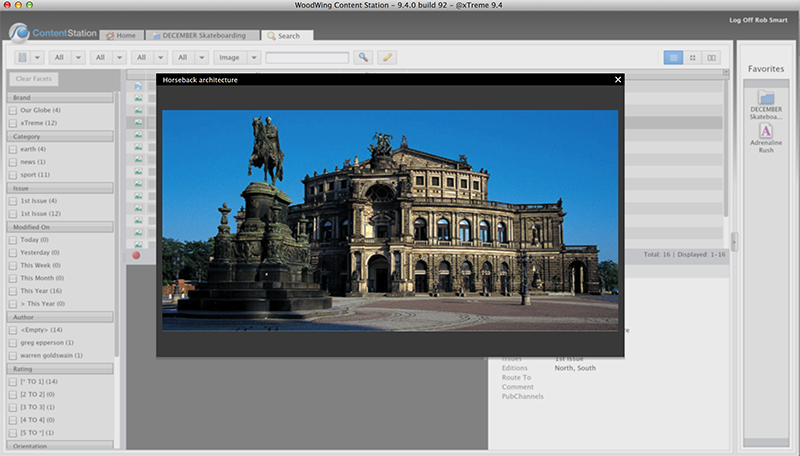 The file will appear in a preview window. Content Station is used for creating and managing content that will eventually be published. In today's world, publishing can be done in various ways: as a printed newspaper, magazine or book, to a Web site, to a tablet or smart phone, and so on. In Content Station (and the Enterprise system to which Content Station is connected), these methods are referred to as 'Publication Channels' (and sometimes just 'Channels'). 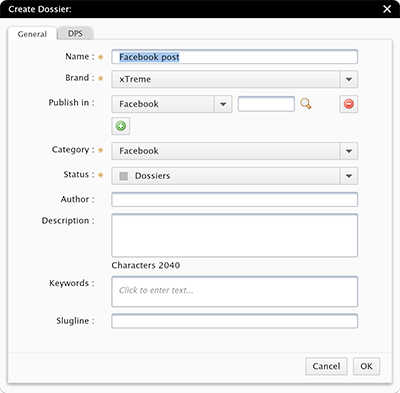 Example: Standard Publication Channels are for publishing to Adobe DPS, Facebook, WordPress, Drupal and Twitter. A typical workflow is to create separate Dossiers, one for each story (see Working with Dossiers below). All content that belong to that story is then added to that Dossier. The Publication Channels to which the story is published is also defined in the Dossier. A story (Dossier) can be published to one or multiple Publication Channels. Figure: The Publication Channels pane in a Dossier shows to which Publication Channels the story can be published. To make this process easy, each Publication Channel will have its own Publish Form (with the exception of publishing to print) that will guide you through the process of providing all the necessary details and components. A Dossier forms the basis of a story: it is used for gathering all files that are related to the story and it contains tools to publish a story to a Publication Channel such as the Web or Adobe DPS. Creating a Dossier in Content Station can be done in many ways but we will focus on the most easiest way here: creating an empty Dossier. For more detailed information, see Working with Dossiers in Content Station 9. Step 1. In the Applications pane on the Home screen, double-click the New Dossier icon. The Dossier is created and is opened in a new tab. Note: When doing this with a file that is not yet stored in Enterprise, the Upload dialog box appears. Drop one or more external files onto the Dossier. One of the main features of Content Station is to create an article with the aim to publish it to one or more Publication Channels. Creating an article can be done in many ways but we will describe the most basic method here: creating a new article from scratch. For more detailed information about all other methods of creating an article, see Creating a new article in Content Station 9. Step 1. On the Home screen, double-click New Article in the Applications pane. The article will open in a new tab. 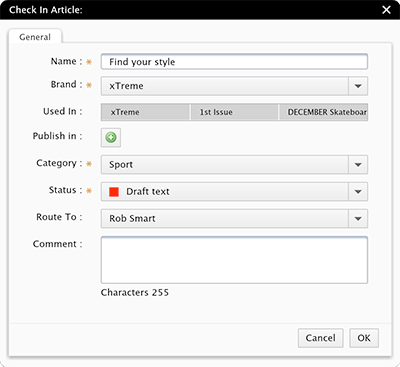 Figure: The different areas of the new article screen: the Paragraph Styles pane (A), the Character Styles pane (B), the Editing pane (C) and the Preview pane (D). Articles are made up of at least one component and regularly have multiple components. A basic article for a story that is going to be published in a newspaper contains the components 'head', 'intro' and 'body'. Each component clearly defines the type of content it should hold: the title of the story should go in the 'head' component while the actual story should go in the 'body' component. Article components also indicate how they should be styled: a 'head' component will usually be styled in a large font size while a 'body' component will be styled in a regular font size. Step 2. Start writing your content in the Editing pane and format the text using the available paragraph styles and character styles. Note: The Preview pane will remain empty until the article is placed on a layout. To increase the size of the Editing pane, hide the Preview pane by dragging the handle bar between the Preview pane and the Editing pane all the way to the right. Step 3. Click the Check In button in the toolbar. 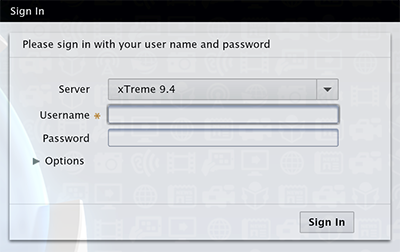 The Check In Article dialog box appears. Step 4. Enter a name for the article and optionally change the location where in the system it needs to be stored, as well as any other properties that are shown. All popular file types can be uploaded: from documents, images and videos, to presentations, spreadsheets, ZIP files and many more. For a detailed overview, see File formats supported by Enterprise 9. 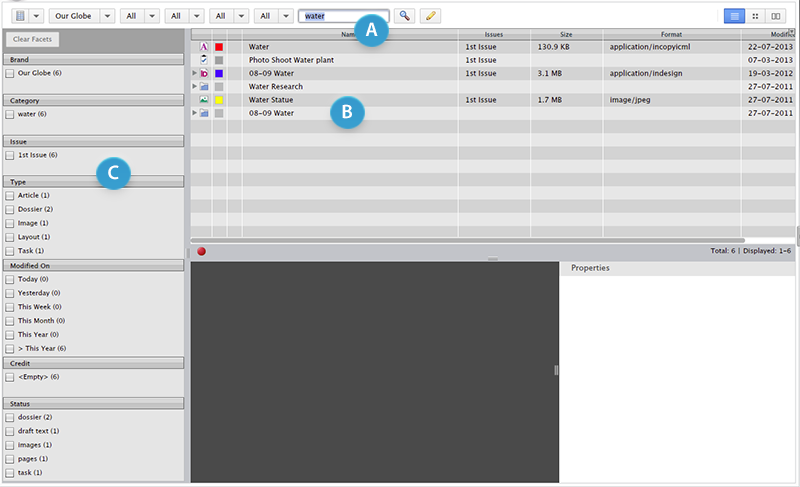 Figure: Different areas where a file can be dropped on: (A) the Dossier Content option in the Info pane of an opened Dossier, (B) the Document pane of the Dossier Content option of an opened Dossier, and (C) a Dossier icon anywhere in Content Station (here in the Favorites pane). 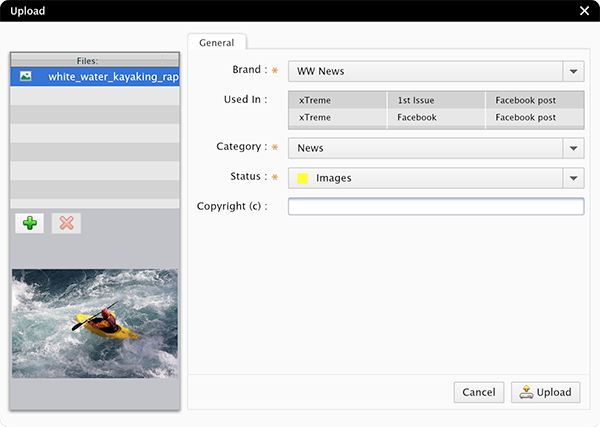 After dropping the file, the Upload dialog box is shown, as explained below. On the Home screen, double-click Upload in the Applications pane. Click the Upload icon in the toolbar of a Dossier. Step 3. (Optional) Change the properties as needed. The files are stored in Enterprise. One of the main features of Content Station is the ability to publish a story to Publication Channels such as a Web site, Facebook, WordPress and Twitter. Step 1. Create a new Dossier to represent the story or open an existing one and assign the Publication Channel(s) to which the story needs to be published. Step 2. Select a Publication Channel. This will generate a Publish Form (you might have to choose one from a list). Step 3. Construct your story by filling out the Publish Form. 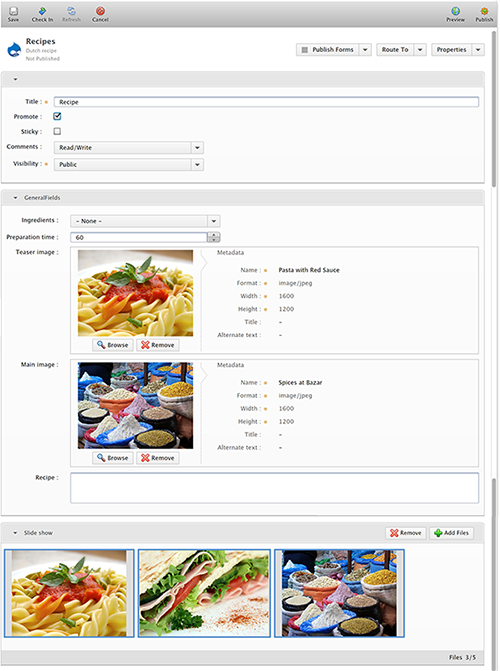 This consists of creating an article or choosing an existing one, optionally adding images, and entering all required details. When logging out or quitting Content Station any panel settings are saved so that you can make use of these settings the next time you log in, even when doing so from another system. Click Log Off in the top right corner of the screen. Content Station AIR: Press Cmd+Q (Mac Os) or Ctrl+Q (Windows).